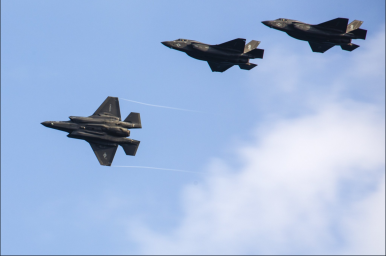 The U.S. Marine Corps finished deploying a squadron of F-35Bs last week. U.S. Marine Corps Fighter Attack Squadron 121, the service’s first overseas-deployed F-35B squadron, is now up to full fighting strength with the arrival of the last three F-35B stealth fighters on November 15, according to a U.S. Pacific Command statement. The squadron now has a full complement of 16 aircraft. The last three F-35B aircraft of Marine Fighter Attack Squadron 121 arrived at an Iwakuni airbase in Yamaguchi Prefecture, Japan last Wednesday. The F35B is the U.S. Marine Corps variant of the supersonic fifth-generation F-35B Lightning II Joint Strike Fighter, capable of vertical or short takeoffs and vertical landings without requiring a catapult launcher. The F-35B was developed as a replacement for the Marine Corps’ F/A-18 Hornet, AV-8B Harrier and EA- 6B Prowler aircraft. “The F-35B brings strategic agility, operational flexibility, and tactical supremacy to the Pacific with a mission radius greater than that of the F/A-18 Hornet and AV-8B Harrier II in support of the U.S.- Japan alliance,” according to the U.S. Marine Corps. The first ten F-35Bs deployed to Japan from Marine Corps Air Station Yuma in Arizona in January. “The unique combination of stealth, cutting-edge radar and sensor technology, and electronic warfare systems bring all of the access and lethality capabilities of a fifth-generation fighter, a modern bomber, and an adverse-weather, all-threat environment air support platform,” the U.S. Marine Corps noted in a January 12 statement. As I reported previously, the first two of 12 U.S. Air Force F-35A Lightning II — the F-35s conventional takeoff and landing variant — arrived at Kadena Air Base, Okinawa for a six-month rotation earlier in November. “This long-planned deployment is designed to demonstrate the continuing U.S. commitment to stability and security in the region,” said in a press release. The Japan Air Self-Defense Force (JASDF) took delivery of its first F-35A fighter jets this year through the U.S. Foreign Military Sales Program. (…) Japan’s Ministry of Defense selected the F-35A in December 2011 following the F-X competitive bidding process. (…) The JASDF is expected to induct a total of 42 new F-35As in the coming years. Another U.S. ally, South Korea, will begin receiving its first F-35As in 2018. The South Korean government has ordered 40 F-35A aircraft with delivery expected to be completed by 2021. South Korea has been considering procuring 20 additional F-35As. The United States, Japan, and South Korea will not be the only powers operating advanced stealth fighter jets in East Asia. According to Chinese media reports, the People’s Liberation Army Air Force’s (PLAAF) first fifth-generation fighter aircraft, the Chengdu Aerospace Corporation (CAC) J-20 multirole fighter is slated to enter serial production in the coming months.